This simple sirih junjung was made for the magazine photo shoot in June. I’m not sure whether it has been published since I haven’t got the chance to check at the news stand or book store. Anyway, for those getting engaged or married this month and still looking for ideas on how to make sirih junjung for your event, you can always try this simple style. Find a round container like an ice cream bowl or even an empty biscuit tin and put the floral foam inside. Arrange daun sirih all around the container. Fill up the middle with flowers of your choice, bunga pinang, kapur and gambir. I put the white candle inside the container first and fill up all around it with floral foam. Reason being I want to put the wedding/engagement ring on the candle. 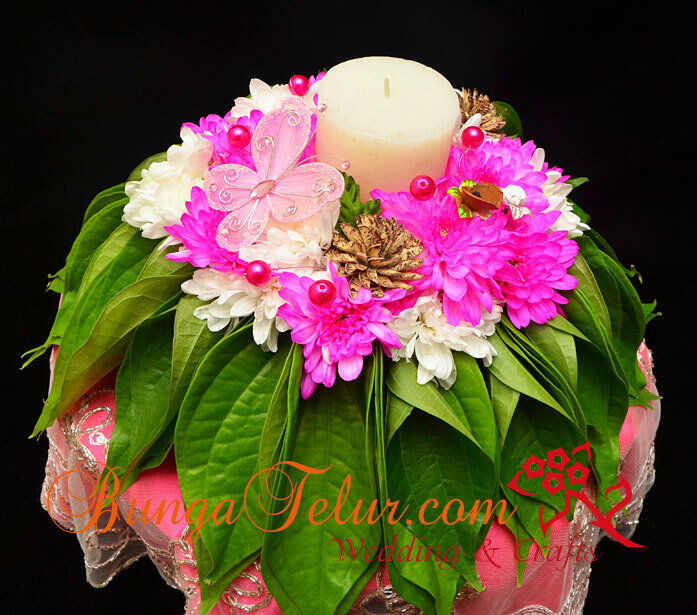 Hope this simple sirih junjung will help you cut cost in preparing all the special hantaran for your loved one.